Raspberry Pi enthusiasts looking for affordable robot kits and cases for the awesome Raspberry Pi mini PC that are both strong and lightweight might be interested in a new solution created by TLBRC and Kre8 based in Northampton in the UK. The Raspberry Pi Case4-Kits are a range of case designs used to protect and house Raspberry Pi and is components such as batteries and motors for project work. Watch the video after the jump to learn more about how the Case4-Kits could enhance your next Raspberry Pi project. “From the Raspberry Pi’s inception, I as an ex-technology teacher, inventor and MD of Kre8 Products have been a keen supporter of the Raspberry Pi Foundation with its emphasis on helping schools introduce computer programming and STEM subjects. To this end I attend Raspberry Jams, CAS Teacher meetings and exhibitions to see what teachers want. Quite a few complain about the high cost of the accessories so I started developing a range of low cost Raspberry Pi kits made from Kre8 SuperSheet, a new ‘maker modelling sheet’ that was originally invented for use with the Kre8 Making System. 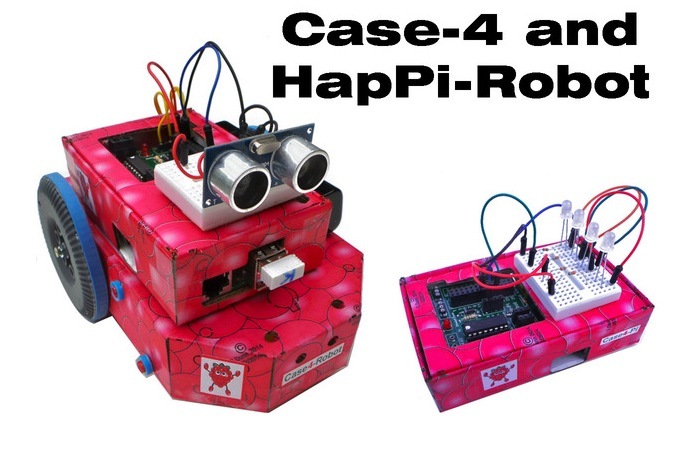 The initial range of consists of: Raspberry Pi case (Case4-Pi), a robot case (Case4-Robot), a battery case (Case4-Battery), HapPi-Robot and HapPi add-on motor controller board. Kre8 Products Ltd and TLBRC are pleased to work together to launch this Case4-Kits and Robot Kickstarter Campaign. For more information on the new Raspberry Pi Case4-Kits jump over to the Kickstarter website for details. For more details on Raspberry Pi displays and HATS jump over to our essential guide.